Observing the sweetness of a papa house finch tenderly feeding his little princess got me thinking about bird dads. What a convenient time for a special Father’s Day post! Even before their little ones hatch, bird dads are almost always on the job tending to mom and the nest. 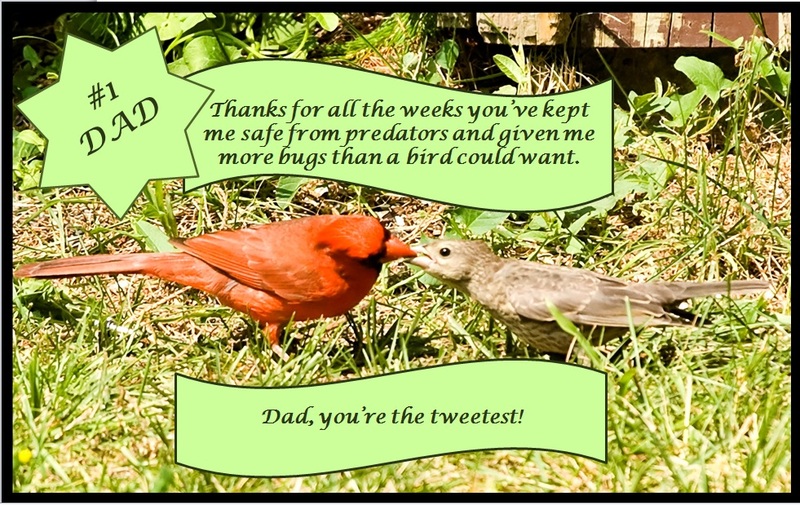 For altricial species, dad’s job can be incredibly demanding as a protector and provider. Some split the job with mom while others provide exclusively for the whole gang. Different species employ different methods of operating their nurseries and feeding their ever-hungry babies from dawn till dusk. Cassowary – Daddy cassowary gets a gold star for being a devoted single father since the female leaves him almost immediately after laying eggs. This fierce family defender will incubate the eggs and care for the young after they hatch for about nine months. Blue Crowned Laughing Thrush – More of a family affair, these critically endangered birds share the care of the young with other families in the population. Adults will assist in the feeding of other young, even outside their own related family. Compassionate is the father bird who answers the cries of another’s hungry baby. Emperor Penguin – Papa penguin takes the incubation task right after the egg is laid. Mom leaves for up to two months to find food, leaving the father to brave the cold and care for the egg. ON HIS FEET. THE WHOLE TIME. AND NOT EATING. Mom then returns to feed the newly hatched chick at which time dad can finally leave for his food-finding expedition. Great Horned Owl – After helping his lady establish a proper nursery for the to-be owlettes, papa great horned owl will take the task of providing food for the both of them while she incubates the eggs. His work to find enough food is a greater challenge, considering she is about 25 percent bigger than he is (as is typical in birds of prey) and they’ll have very hungry fledglings that may continue to beg even after they’ve left the nest. Hornbills – Before laying eggs, the female hornbill seals herself off in a tree cavity, leaving a hornbill beak-sized opening that allows the male to pass food along to her and eventually the chicks. When the chicks are ready to leave, he will help spring mom and their young from the cavity but will continue to provide for them until they are able to care for themselves. Jacana – Talk about daddy day care! The bigger and dominant females may take up to five mates in a breeding season and lay eggs in the various nests. It’s the males’ job to incubate the eggs and protect the chicks from danger until they are ready to leave the nest. Malleefowl – This male from the Land Down Under can spend up to a year building an impressively large mound as a nest. He works the land to create a mound for nesting and fills it with organic materials that will help maintain the nest’s heat as the materials decay. He maintains the nest and watches the chicks until they leave. Red Phalarope – This sea-side sire sticks around after the female lays her eggs to incubate them and care for the chicks. They are precocial, which means that the chicks leave the nest able to feed themselves, but dad stays around to monitor their safety for the first couple of weeks. Red-tailed hawk – This hawk fulfills his responsibilities as a father by both aiding in the incubation of the eggs and doing all the food shopping for mom and eventually their chicks. When he returns to the nest with their meals, mom helps prepare it in order to feed the little ones. Roughly 5 percent of male mammals rear their young as compared to about 90 percent of male bird species. Research suggests that this practice was established in the days of the dinosaur. Fossilized remains of nests indicate that there was a paternal care system in place, possibly even before they learned how to fly. This male-based care system may have been passed down over time to their ancestors – birds. It Takes All Kinds: Fatherhood is for the Birds posted by Megan Neal in Birds, Births and Arrivals – New Animals!